One scene from Mean Girls was filmed in my high school, years before I attended, so naturally I consider the movie in most of my life decisions. 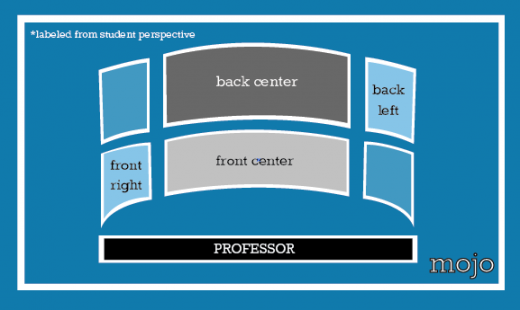 With a full week of class approaching, it’s time to start determining what type of person you are, and that starts with where you sit in class. While we may not have the savage environment of a high school cafeteria, a UCLA lecture hall says a lot about you: your personality, your favorite Jolly Rancher flavor, your political views, your preference in the J Cole vs. Diggy Simmons feud, and whether or not you wear pink on Wednesdays. A lecture hall can be split into 6 sectors: a front and back half, with a right, left, and center section in each. We’re only going to focus on the major 4. Let’s start this party off in the best fashion possible, focusing on those who get to class first. Front section, center: These seats are under high demand, but perhaps for a different reason than you think. This section is filled with the smartest UCLA students, and not because they receive the best grades. Students sit here because professors look right past them. Whereas you may think Professor History would love to talk to those up front, he is looking towards the back of the class. As a result, you can get away with ANYTHING here. You are so overlooked that as you angrily call customer service regarding your broken Razor Scooter’s wheelie bar, it simply doesn’t affect the class. Front section, right: Watch out for this section. These guys produce the absolute best questions out of nowhere. I expect you to get extremely excited when somebody in this area raises their hand because he or she is going to drop serious knowledge. Legend has it that once, a student from front-right asked a question that resulted in a huge emotional breakdown by the professor. I wish I knew what that question was. Back section, center: Eyes are on you because of those geniuses in the section in front of you. You have to make it look like you’re being productive – no sleeping allowed in this area. There are only two solutions: one is, if you use a computer for notes, here’s the time to catch up on missed television. Copious amounts of Kenan and Kel are consumed here. If you are prone to using a notebook, bring it back to fourth grade as MASH is your best bet. If there’s no chance of you talking to that cute girl in “front section, right,” at least you have a chance in the game. Back section, left: Greetings from the land of latecomers. Whether it’s the kid who thought the class started a half hour later, or a rough night resulted in oversleeping, this area is filled with lost looks. You haven’t experienced confusion until you’ve walked into class halfway through the lesson on obstetrics and gynecology. Most are envious of this sector, however, because of their consistent possession of delicious sweets and treats.